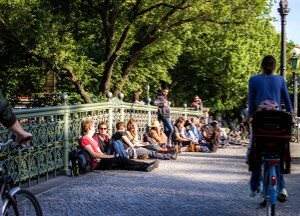 Getting a credit card in Berlin is one of the first tasks you should take care of. But how to find the best credit card in Berlin? There are so many credit cards issued by different banks and with different costs and loyalty programs that it is easy to lose overview. But with our help you will find the best credit card for your current situation and needs. See our recommendations based on costs and service for each credit card. Recently started in Germany N26 brings online banking to your computer and Smartphone. 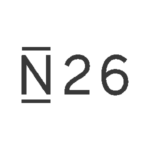 N26 is one of the few German banks that still offers a completely free of charge Credit Card with their bank account. And the Mastercard is not only free of charge for the first year but forever. On top of being free of charge the N26 Mastercard also offers up to 5 free cash withdrawals per month at any ATM in Germany and unlimited free cash withdrawals at any ATM outside of Germany. This feature makes the N26 credit card a great option for any frequent traveler. Signing up for a N26 Mastercard is as easy as it gets. The whole process is only and without sending around any papers. Oh and what is especially awesome the whole signup process is in English! When opening a DKB cash account (current account) you will automatically also get a free debit card and a free DKB Visa credit card. Yes, you read correctly, both the credit card and the debit card are completely free of charge at DKB. DKB has won several tests in leading German consumer magazines as best (direct) bank and that not for no reason. These all are reasons why the DKB Visa Credit Card is widely referred to as the best credit card in Berlin. Especially the point that you can get cash without any fees at any ATM in Berlin comes in very handy. Usually if you sign up with a traditional bank you can only get out cash at their branches or their own ATMs. But unfortunately Berlin is missing a dense net of ATMs, so with your DKB Visa credit card you don’t have to worry about that. Another very good choice for a credit card is the Visa Credit Card issued by Postbank. Especially as DKB has rejected some applications in the past Postbank is a very good alternative. The best way to get a free Visa Credit Card is to sign up for a Postbank Giro plus and opt in for the free Visa Credit Card. However be aware that the Credit Card is only free of charge in the first year. If you want to keep it for another year the yearly costs are 29€, which is still ok compared to many other banks. If you want more information about the current account (Postbank Giro plus) that comes with the credit card continue reading here. In the past we heard that comdirect is not as strict as DKB to accept people with lower monthly income when applying for a credit card. So if you are rejected by DKB our third choice would be Comdirect. When signing up for a current account with comdirect you will automatically, similar to DKB cash, get a free Visa card and debit card. As mentioned before Berlin does not have too many ATMs around so you will thank us later when you are running out of cash and are on the search for the nearest ATM. Any money withdraw is for free no matter to which bank that ATM belongs to with your Comdirect Visa credit card . Anybody coming from countries like the US or Brazil will be shocked to find out how difficult it is to pay in shops with your credit card. You might think Germany is a very modern country, but when it comes to paying with credit cards it is really far behind. Basically no major supermarket or fast food chain accepts payments by credit card in Germany. The situation is even worse in Berlin where not even the most expensive restaurants might accept credit cards. If you are planning on going for dinner make sure to check on the website if credit cards are accepted. 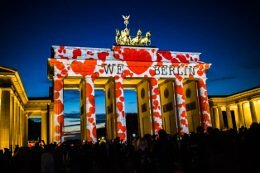 In general Visa and Mastercard are the best credit cards in Berlin. If you are trying to pay with your American Express credit card you will have a very hard time in Berlin. Most places only accept both Visa or Mastercard, only few shops also take American Express. Our tip is to always carry around enough cash in case you can’t pay with credit card or at least make sure to know where the next ATM is so that you can get out cash for free. Even with all those limitations having a credit card in Berlin comes in very handy. Getting out cash is for free (at least with DKB and comdirect credit cards) and almost all online shops in Germany accept credit cards as matter of payment. Debit cards (called EC-Karte in German) come in very handy for paying without cash. 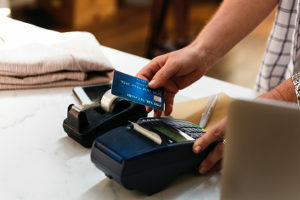 Most supermarkets, restaurants or gas stations accept payments by debit card. With DKB and comdirect you get a free debit card as well so make sure to always carry both your debit card (for paying cashless) and credit card (getting out cash at ATMs for free) around with you. Continue reading if you are interested in more details about DKB and other banks in Berlin.